The worst is over, but the founders of Delhi’s iconic Akshara Theatre are not taking any chances. Last month, the 44-year-old institution was sent an electricity bill of around Rs 3 lakh. The bill was due on March 1 but the theatre could not pay up and it soon received a notice that its electricity connection would be disconnected if the bill wasn’t cleared by March 15. “They just sort of jumped that big bill on us,” said theatre artist Jalabala Vaidya, who co-founded Akshara Theatre along with her husband, playwright and director Gopal Sharman in 1972. To raise money to pay the bill, the couple decided to ask the audience at Akshara for donations. They even started a campaign on the crowd-funding website BitGiving. And then stand-up comedian Papa CJ, who believes Akshara is one of the best places to perform in India, saved the day – he donated the entire bill amount to Akshara. The goal on the BitGiving page is set as Rs 5 lakh; the campaign has managed to generate over Rs 3.5 lakh so far. Tucked away next to the busy Ram Manohar Lohia Hospital in the heart of central Delhi, Akshara Theatre has entertained the capital for decades. First-time visitors could easily miss the small entrance where an unassuming little gate gives way to an arts complex spread over a leafy acre of land. The complex includes an indoor wood panelled theatre, an amphitheatre flanked by two peepal trees and a 40-seat acting area for poetry and song. 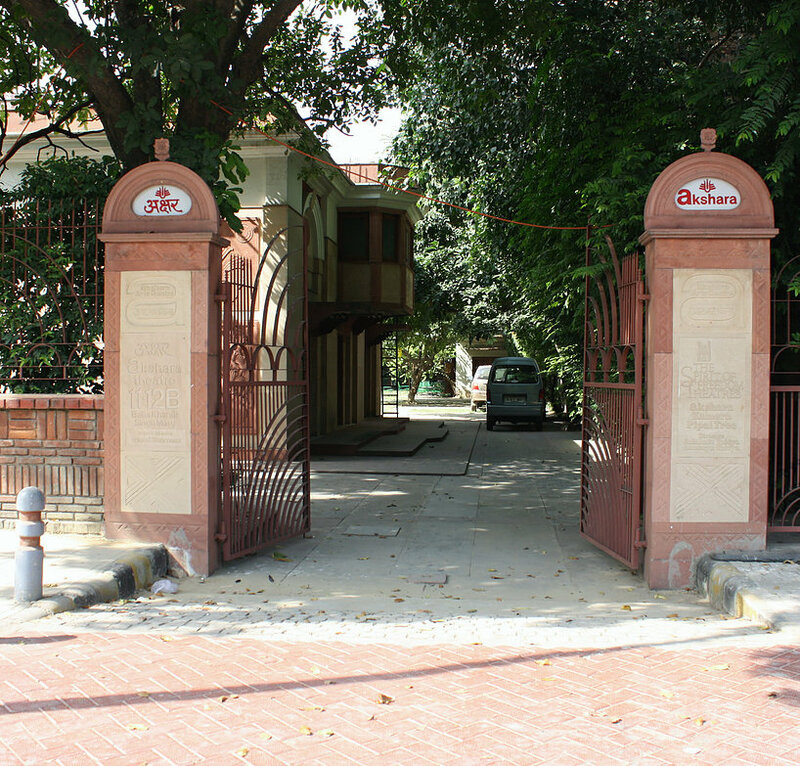 The entrance to Akshara Theatre (Photograph: Courtesy Aksharatheatre.com). 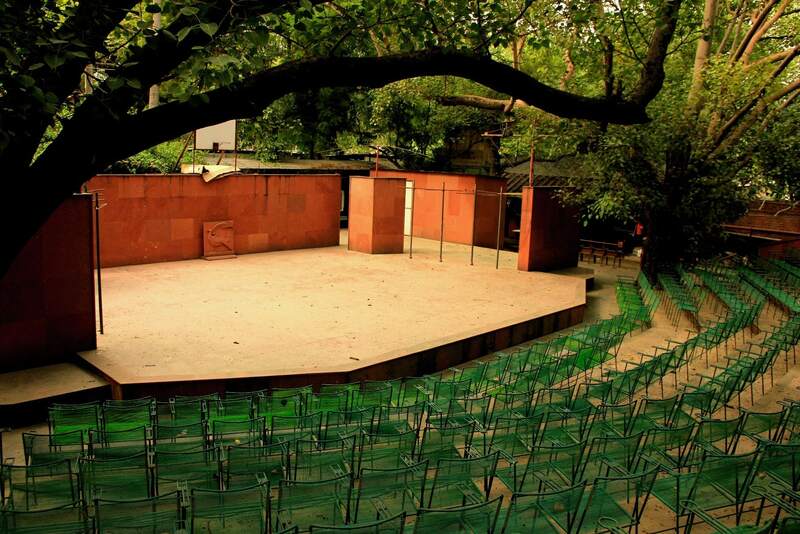 The amphitheatre at Akshara (Photograph: Courtesy Aksharatheatre.com). Its Larflarflarf series of political satires have performed to full houses before every national election for decades. “No political party, no matter how virtuous they may make themselves out to be, likes our satires,” said Vaidya. “But Akshara has always spoken freely. We have never stopped. In fact we performed even during the Emergency, lampooning Mrs Gandhi herself.” Akshara’s BitGiving page says that the house was so packed during this particular performance that if the door was opened midway, people fell out. One of its most famous productions is The Ramayana, a dramatised retelling of the epic written by Sharman and performed by Vaidya. 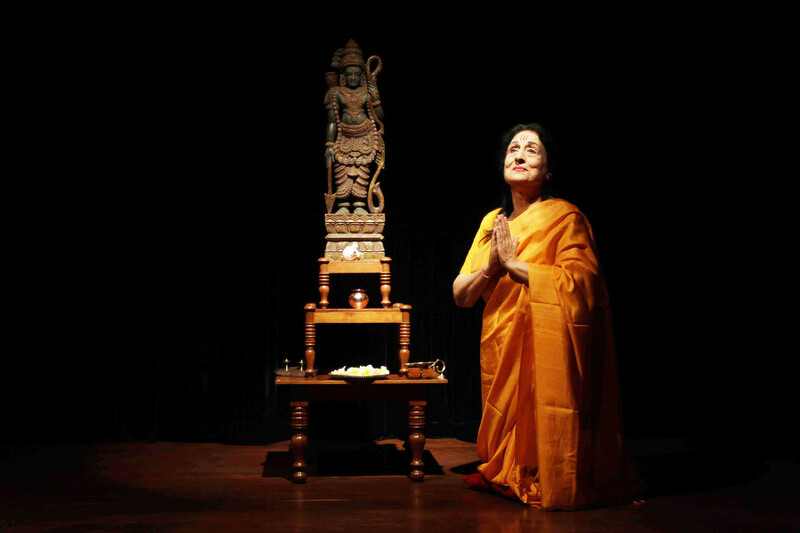 The play, enacted in the traditional Indian katha or storytelling style, travelled the world. In 1975, when it reached New York, the New York Times called it “India’s gift to Broadway”. Jalabala Vaidya in ‘The Ramayana’ (Photograph: Courtesy Aksharatheatre.com). 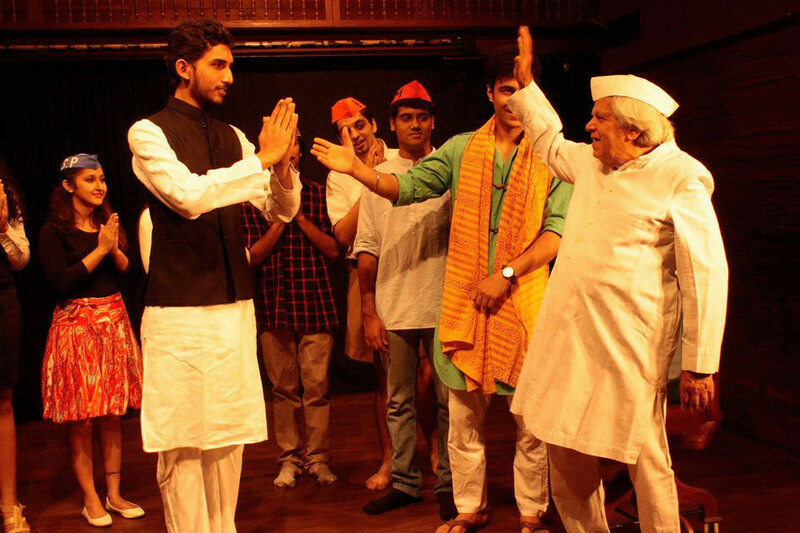 Gopal Sharman (extreme right) performing a political satire (Photograph: Courtesy Aksharatheatre.com). The theatre stands on land allotted to Sharman and Vaidya in the late 1960s with the help of Morarji Desai, who was then the deputy prime minister. That was the time Sharman and Vaidya were contracted by the Royal Shakespeare Company to take The Ramayana to Britain. As nationally eminent artists, they were leased the space in what is now prime property for rehearsals and performances. Registered as a non-profit cultural society, Akshara is no stranger to hard times. At present, the monthly cost of running the theatre is around Rs 5 lakh. Despite fairly consistent footfalls, Akshara has been short of cash before, but has managed to raise money thanks to fundraising shows by theatre veterans and those from the world of stand-up comedy. This is the first time its founders have had to resort to a crowd-funding campaign. Vaidya said this was the first time the government has offered help. “We have been low on funds before, but nobody from the government has ever offered help,” she said. But though Mishra did send a representative to meet Vaidya and Sharman, something concrete is yet to come out of it.